I've been having quite the experience writing with the Topical Bloggers (see right). When I got the topic for this week, Physician Assisted Suicide, I thought, "Wow, what a deep topic!" I've never been really close to anyone being faced with that decision. I've never even really given the subject much thought. After all, it's not considered polite conversation while sipping a Starbuck's to discuss whether we'd rather be lying in a graveyard or lying in a hospital bed waiting to die. In thinking of what to write, I discovered I have many questions. 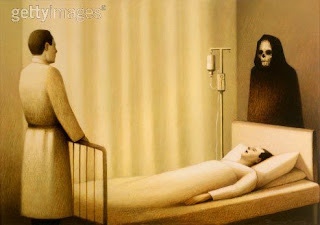 On the surface, it "seems" ethical that if someone is in great pain from a lingering incurable disease, and the patient has the presence of mind to want to end their life, then he or she has the right, or entitlement, to do so. Once I started to look below the surface, it's not so simple. I thought about legal issues - how do we know the patient is making a rational, informed decision? What can keep a family member or anyone else from manipulating the patient to do something they may not want to do? What about the integrity of the doctor? In the classical version of the Hippocratic Oath, a doctor declares that he "will neither give a deadly drug to anybody who asked for it, nor will I make a suggestion to this effect." Yet the modern version of the same oath, revised in 1964, is not so definitive: "Most especially must I tread with care in matters of life and death. If it is given me to save a life, all thanks. But it may also be within my power to take a life; this awesome responsibility must be faced with great humbleness and awareness of my own frailty. Above all, I must not play at God." Life is a gift from God. Only God knows when we will die. Yet in His omniscience, God also knows how we will die, whether by natural causes, accident, by the hand of another, or by our own hand. When looked at in terms of God being in ultimate control, can a physician or anyone else truly "play God"? In November, 1997, Gary Eisler, who lives in Oregon, wrote an op-ed piece in the Wall Street Journal. In poignant words, Eisler describes the slow, painful death from cancer of his beloved wife, Bonnie. When the cancer spread from Mrs. Eisler’s breast to her brain, her doctor recommended that all treatment be stopped. Bonnie Eisler spent the last two months of her life in agonizing pain. And yet, Eisler says, many “wonderful things” happened during that time: the birth of their first grandchild, a last Christmas together. Despite his wife’s suffering, Eisler writes that their last hours together were “some of the most intimate and precious of our marriage.... Reason and compassion would have dictated that Bonnie’s life be ended weeks earlier,” Eisler says, “but how much poorer everyone—including her—would have been.” Eisler ends his piece with a warning. Unless assisted suicide is repealed, he predicts, “it will not be long before the vultures begin circling.” Cancer treatment, after all, is expensive. If Bonnie Eisler had known the cost of her treatments, her husband says, “she might well have felt she was a burden” and opted to kill herself. Eisler asks one final question: “Will what has been ‘optional’ someday become ‘suggested’— and perhaps eventually required?" Even in Bonnie's unbearable pain she still was able to participate in something precious. I pray that no one reading this will ever be in a position where he or a loved one will have to consider this issue for himself. I cannot make decisions for someone else, especially decisions of this magnitude. But I can say that in writing this blog post, I have had some of my own questions answered.